Facebook never stands still for too long – and neither can it afford to. 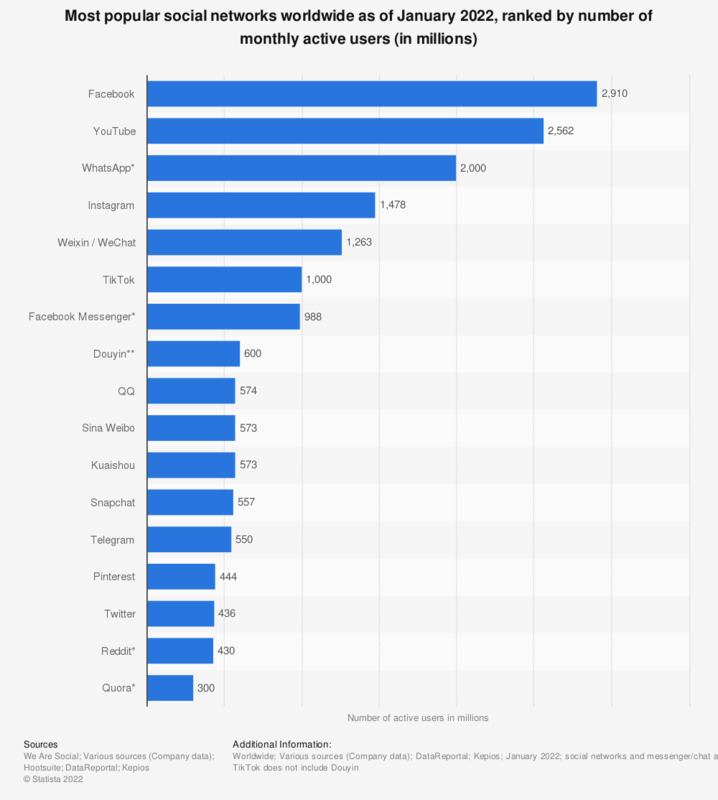 As a pioneer of the social networking age and the platform with the most active users worldwide (as shown in the graph below) it faces fierce competition. The passing of time and progress in technology and how we use it means that changes and improvements to the usability of social media are inevitable. But it does seem just lately that, for Facebook at least, this momentum for change has stepped up a gear with quite a few significant updates that are already beginning to have an effect of how we think about the relationship of social media and digital marketing. Ever since Facebook introduced the ‘like’ button in 2009, there has been a persistent call from, well, everyone for the icon’s evil twin brother – the dislike button – to appear alongside it. Fast forward 7 years and it seems that it’s now unlikely that we’ll ever get to, especially with the introduction of Facebook reactions. It’s clear that Facbook have been listening – they understood that that sometimes a ‘like’ is an inappropriate response to certain types of posts – ‘liking’ the news that a friend’s pet has passed away, for example, could be construed as a little cold. So rather than introducing the ‘dislike’ button, with all its negative connotations, the rise of the emoji has encouraged the introduction of ‘Reactions’ instead. Some critics have responded by saying that thanks to Facebook reactions, ‘humanity has been boiled down to six emotions.’ It’s not all bad though; the ‘haha’ reaction has the potential to make the heinous acronym ‘lol’ obsolete by the year 2020. ‘Reacting’ appeals because is just as quick as ‘liking’ but offers a wider spectrum for how users choose to respond – encouraging more engagement as users are able to feel that they can express themselves more clearly without having to go to all the trouble of actually writing a comment. Has Mark Zuckerberg been reading Harry Potter again? Back in September of last year, us muggles thought we were having an episode when we noticed that some of our friends profile photos were coming to life when we viewed their page. Alas, there’s no magic involved, just Facebook up to its old tricks again. The ability to use a 7 second video loop as your profile pic was introduced to allow you to ‘express yourself’ and give ‘your friends a taste of your creativity’ according to the video below. But it’s real purpose is to make the Facebook experience more stimulating and addictive, once again giving images and video the upper hand over static content. Canvas Ads are another update designed for mobile. Launching in-app full screen rich media ads – according to Facebook, this new way of mobile marketing will give advertisers the opportunity to ‘tell their stories’ through an ‘immersive and expressive experience’. The ads don’t launch unless a user clicks on them, but once they do, much like the profile videos, the ads come to life offering an interactive experience for the user. Just take a look at the L’OCCITANE canvas ad example below, from instapage. Over the years, Facebook has evolved from a social network centred around connecting with friends to a platform that allows you to connect with the rest of the world through what your friends like, comment on and share. In its evolution, there’s no doubt (as much as the company might refute) that Facebook has taken on some of the characteristics of news feed set-up embraced by platforms like Twitter. Again, these are changes which only affect the mobile user, making it clear once again that app development is where Facebook intends to focus its efforts for the foreseeable future. And when you sit back and recognize that 3 out of the 4 of the above recent changes have been enforced to improve the mobile experience, any businesses wishing to promote themselves on Facebook would be wise to take note and shape their strategy accordingly.